Gibb at the meet-an-greet efter the Dubai Jazz Festival on 1 Mairch 2008. 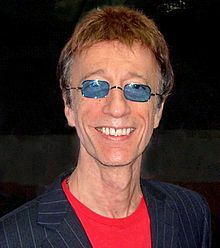 Robin Hugh Gibb, CBE (22 December 1949 – 20 Mey 2012) wis a Breetish sangster, sangwriter an record producer, best kent as a member o the group Bee Gees. ↑ Hughes, Andrew. The Bee Gees - Tales of the Brothers Gibb. Retrieved 29 January 2013. ↑ Brennan, Joseph. "Gibb Songs: 1969". Retrieved 17 May 2013.